This script allows you to customize random encounters on your maps during the game. For example, initially there might be slime and rats wandering around the map, but after certain events take place in the game, the rats disappear and there will only be slime left. To accomplish this, you would start with slime and rats as possible random encounters, but then afterwards you would remove the rat encounter from the list. You will need to understand the concept of an “encounter ID”. This is basically a number or a name that you give to your encounters. 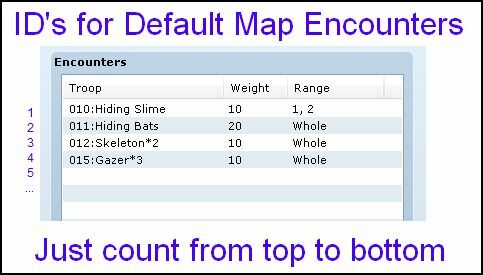 default encounters, and they are given ID’s based on the order they appear on the list. The first encounter is ID 1, the second is ID 2, and so on. Custom encounters are encounters that you add during the game via script calls. You can give them any ID you want. For example, if you have an encounter with two slimes, you can literally call it “two slimes”. The purpose of the encounter ID is to make it easier for you to reference the encounter later on such as if you wanted to delete it. `enc_id` is the ID of the encounter. `weight` is the chance that this encounter will be selected, as a weighted probability. For example, if one troop has a weight of 20 and another troop has a weight of 40, then the chance of encounter troop one is 20/60, where 60 is the sum of all the weights. `regions` is a list of regions that this encounter will appear in. You can limit the encounter to only appear in the regions. If the regions are omitted, then it assumes you can encounter them anywhere on the map. This will remove the encounter specified by your enc_id. If the map ID is omitted, it assumes you are removing the encounter from the current map. And you will not encounter it again in the swamp. Let’s say you wanted to add troop 2 as an encounter, appearing anywhere, with a weight of 20. The idea here is that if you’re walking in the swamp, there is a higher chance of encountering troop 1. We’ll just give it an ID of 12 because it’s a random number that is not taken. NOOOOOOO the download link is broken, it takes me to a text file, this looks so awesome too! Dude. The text file is the download. Select it all and Copy & Paste it into your Scripts. This is the basic of basics. If you don’t know how to do this, you shouldn’t be plug and playing scripts willy nilly yet. Omg, why didn’t I notice this one? I probably did a bad job advertising it.